Those of you who are interested in my cycling activities will be aware that I’ve taken to twattering my long weekend rides. I first tried tweeting a journey at Christmas, when I undertook a century up to Parsley Hay via Ashbourne; then I tweeted and blogged my next 100 mile plus dayride in the post ‘Darkness has reached its end’. Due to a request from a certain polymeric hippo of this parish, who followed my latest ride via the medium of Twatter and Twitpic, you can peruse the route I took on Saturday 17th April over at Bikely.com by clicking on the outline map below. As ever, I’ve trimmed the route short and chopped out a couple of bits for anonymity. Click on the image to see the full map at Bikely, the excellent route mapping service. Rising slowly. Wootton. 1:07pm, Saturday 17th April 2010. One of my favourite places in Staffordshire is the Weaver Hills – a small but rugged range to the west of Ashbourne, that stand on the border between the softly undulating countryside of the midcounty and the harsher, more rugged Moorlands landscape. I especially like this area in springtime – when the daffodils and cowslips come, when there are neon-green shoots in the hedgerows and young lambs in the fields. On this, my first visit of the year, I headed to my usual start point of Sudbury, straight up the A515. The sun was warm and the wind low as I left the main drag, through Sudbury village and up though Somersal Herbert to Marston Montgomery. Welcome to West Derbyshire, where villages sound like old Motown singers. Dropping down from the Roston Common ridge, I headed across the Dove at Norbury and Ellastone, re-entering Staffordshire. From here, the climb over the Weavers takes in the charming village of Wootton and then the climb intensifies to the summit. 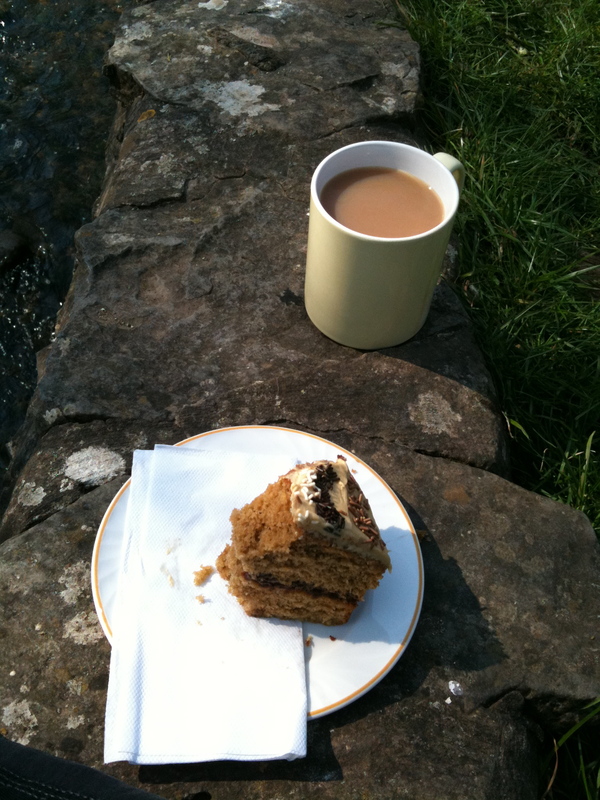 Tea and cake. That's two of the main food groups covered. After the customary flask of Earl Grey on the ridge, taken whilst surveying the view, I dropped over the north side of the Weavers through industrial Cauldon Low. The cement works and quarry here are an apposite reminder that even in the Peak District, commerce must exist hand-in-hand with nature. I went on to join the venerable, and now ageing, Manifold Valley Trail at Waterhouses. I followed the track to its’ conclusion at Hulme end, stopping to take tea and cake at Wetton Mill. 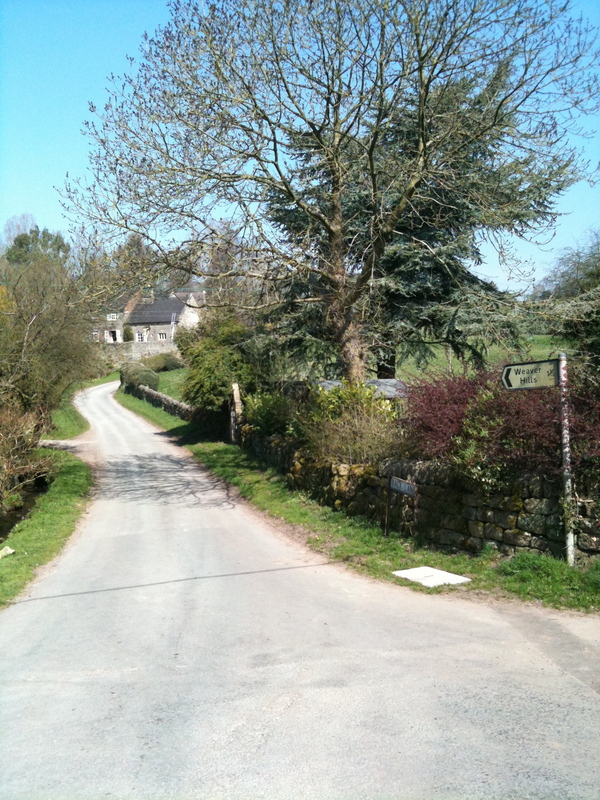 From Hulme End, I nipped up through Hartington and onto the Tissington, then High Peak trails. Returning homeward from Middleton Top, I chose a route east of Carsington Water, taking in Kirk Ireton, Mercaston, Sutton-on-the-Hill, Tutbury, Barton And Lichfield. The weather was fantastic, and the cycling good. The trail kiosk at Hartington (the former signalbox) is now selling the most fantastic local ice cream. The total ride distance before editing was 116 miles, and amounted to near enough 1800 meters of climb. The trails were very busy indeed, and it was a real joy to see plenty of families out enjoying cycling in a variety of forms – from groups, to toddlers in trailers – even a few tandems. All in all, not a bad dayride. 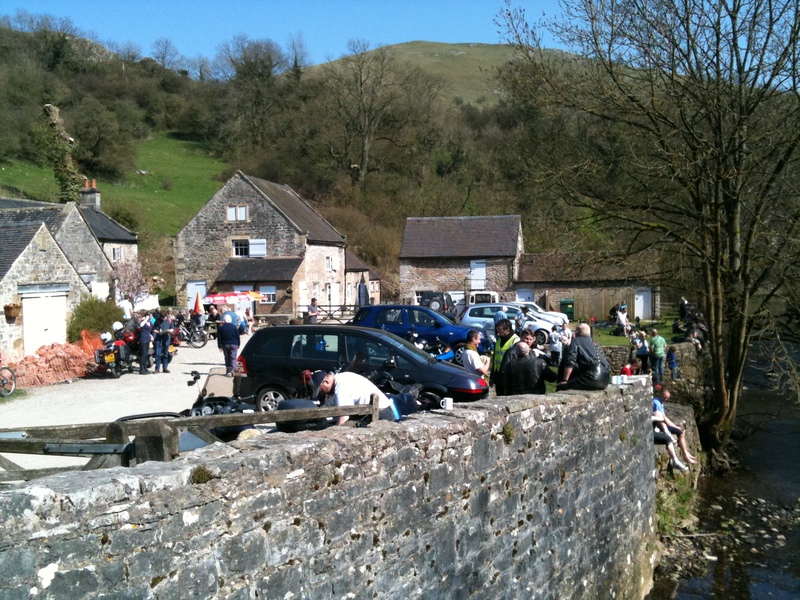 Wetton Mill - Always busy. 2:52pm, Saturday, 17th April 2010. Sadly, my trusty Panasonic compact camera has passed to camera heaven, so I was stuck with a less than inspiring older camera; consequently, other than the images I twattered from the phone, I didn’t take many pictures at all. By chance, at Wychnor, I decided to try and capture the remarkably red sunset over the River Trent. Mist was rising in clouds from the marshes and was catching the light beautifully. Setting the camera on timer on the bridge parapet rendered a surprisingly decent image. Some of the better pictures from the twitter stream are included in this article..
Sunset over the Trent, possibly enhanced by volcanic dust. 8:39pm, Saturday 17th April 2010. Somewhere, in the distance. A view from the top of the Weaver Hills from last year. 6:10pm, Saturday, 2nd May 2009. This entry was posted in cycling, Environment, Fun stuff to see and do, Panoramio photo discussions, Panoramio updates, Shared media, Wildlife and tagged bike rides, Bikely, Cycle rides, Hartington, High Peak trail, Manifold Valley Trail, New Photos, Panoramio, Peak District, Staffordshire, Tissington Trail, Weaver Hills, Wetton Mill, Wildlife, Wootton, Wychnor. Bookmark the permalink.